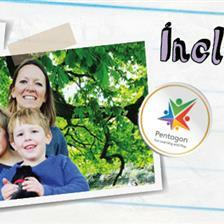 Why Choose Pentagon Play’s Artificial Grass? 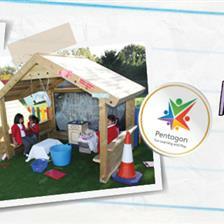 There’s been a revolution in outdoor play and learning. We have moved on apace from the often unforgiving and undervalued school playgrounds of the past and thank goodness for that! Our childhood memories of playing outside at break time, outdoor sports and PE lessons (whilst of course we have many happy and cherished ones) don’t come without the sting of grit-filled grazes on our hands and scabby knees every time we took an inevitable tumble! It seemed like we were NEVER allowed onto the school field - too much maintenance for our poor caretaker who was constantly trying to stop the flow of mud around the place! 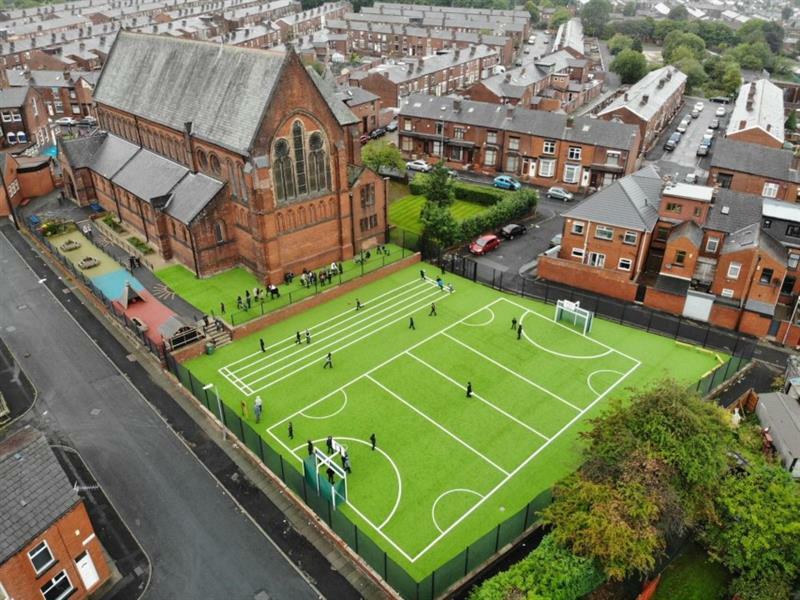 So what is the understated champion of this playground revolution? Artificial Grass. Subtly clever in concept yet dramatic in effect. 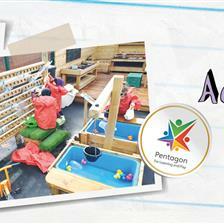 At Pentagon Play, we design, supply and install (amongst other surfaces) Artificial Grass Surfacing especially for schools and nurseries. Produced to high standards even beyond FIFA's rigorous durability tests, it’s not hard to see why our artificial grass has become so popular. Many schools suffer from playground areas badly affected by the weather, rendering them too dangerous for play. Wet and muddy fields are slippy and the hot sun bakes them, causing cracks which trip and bruise. Concrete breaks down due to changing weather conditions and wears, causing falls and grazes (or worse!). Our artificial grass does none of these things and it’s so much kinder to little arms and legs. We install it with a shock pad layer underneath, so it has much more “give”, and has a lovely soft “real feel”, significantly reducing the risk of injury when falls do happen. The low maintenance aspect of our artificial grass makes a huge difference to schools, saving the site manager so much time and effort from a job that never ends, and is more often than not an impossible task anyway. It doesn’t need cutting, feeding or watering and it doesn’t get muddy. A polymeric membrane layer ensures that plants and weeds can’t grow up through it either, so it never needs weeding or tidying! When rain falls, it is self draining, so it allows water to penetrate through the ground rather than pooling. This makes it artificial grass a truly all-weather surface - it doesn’t freeze and it doesn’t dry out, so no hazardous slippy ice or cracked floors to contend with (that means no more grit spreading in the winter!). Because it is a clear surface, it significantly reduces muddy footprints back in school - no more time wasted managing dirty footwear and trying to keep the corridors and classrooms clean and dry after an outdoor run around! The cost-effectiveness of artificial grass comes in part from its low maintenance features. After the initial outlay, that’s it - done. There are no associated upkeep costs and no money wasted on returfing or reseeding areas where grass struggles to survive. The durability of our artificial grass means that it lasts for many years, seeing pupils all the way through school and welcoming new starters too. We recognise that it is never a case of “one size fits all”, which is why we have created an entire range of artificial grass surfaces to suit different budgets and different usage requirements. 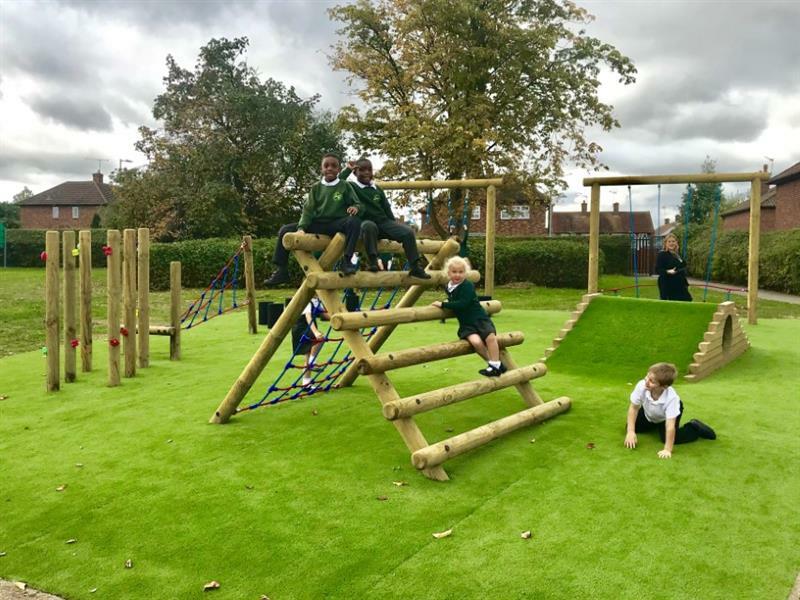 Perhaps most importantly for education provision, artificial grass is money well spent when it comes to making the most of the outdoor space that a school or nursery has. To actually be able to use the outdoor space all year round, without being disrupted by changing weather conditions, or prevented from using an area because it is deemed unsafe or unworkable, is worth its weight in gold. 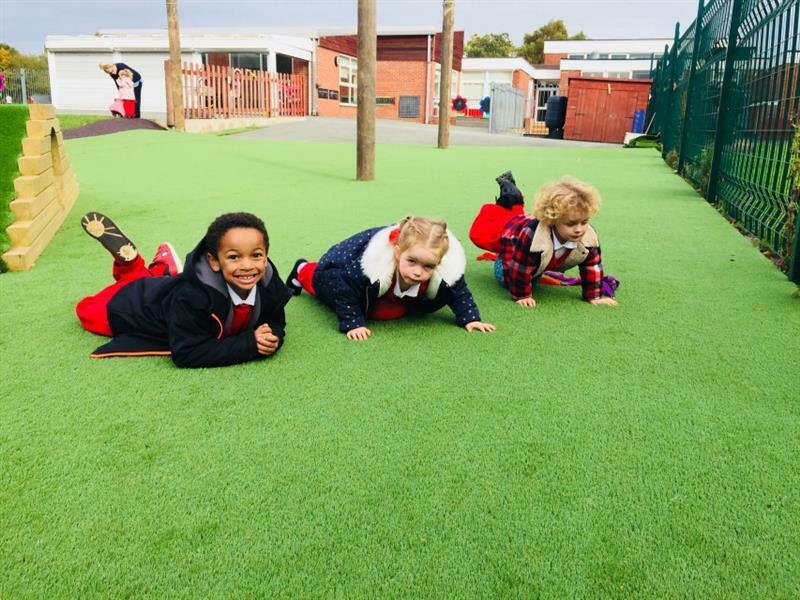 In nurseries and EYFS settings, where free flow between the indoor and outdoor learning environments is encouraged, artificial grass makes this a practical and achievable daily option, where it may not have been before. It works really well installed under and around wet play and messy play areas as it helps to prevent slipping on spillages. It is great for sensory spaces too, offering texture and bright, beautiful colour to lift the mood. 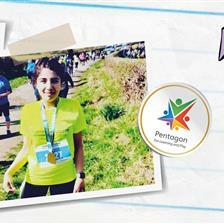 We don’t always just lay it flat on the floor either - at Pentagon, we are much more creative than that! 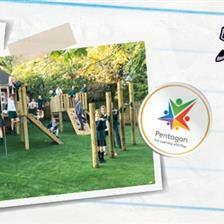 We have designed a number of fun and engaging Outdoor Play Products where artificial grass is a feature. 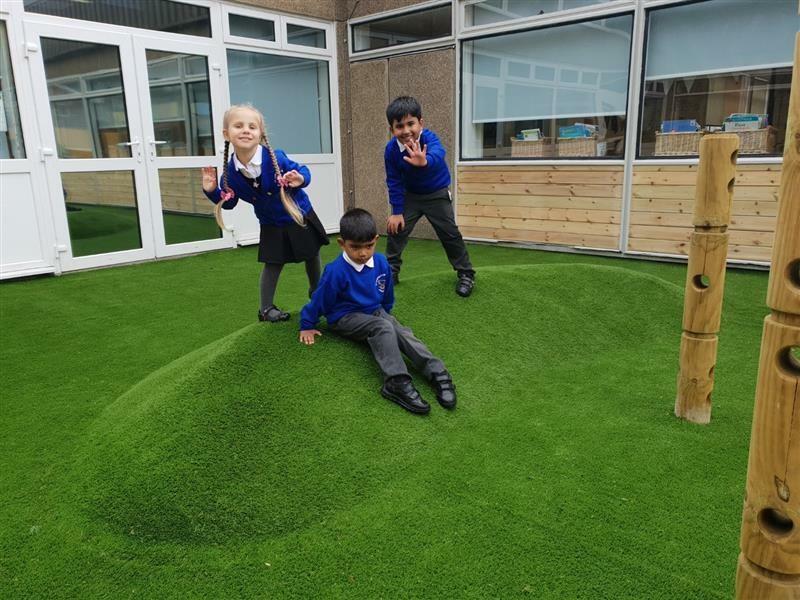 Whether a climbing mound or a secret den bringing a new dimension to creative play, a comfortable seat or a sensory panel for a SEN playground, you would be surprised to see just how much we can do with it. The PE and Sport Premium, offering schools funding to make additional and sustainable improvements to the quality of physical education and sport they provide, can be well spent on artificial grass installation. The Premium must be used to develop or add to a school’s existing PE, physical activities and sport activities and to build capacity and capability within the school to ensure that improvements will benefit future pupils. Added to this, the chief medical officer guidelines recommend that all children engage in at least 60 minutes of physical activity a day, of which 30 minutes should be in school. Having an outdoor space that is useable and accessible year round is essential for any school to be able to manage these requirements. Artificial grass surfacing comes in different forms and our artificial grass sports surfacing options are an extremely popular and worthwhile way of spending the Premium. 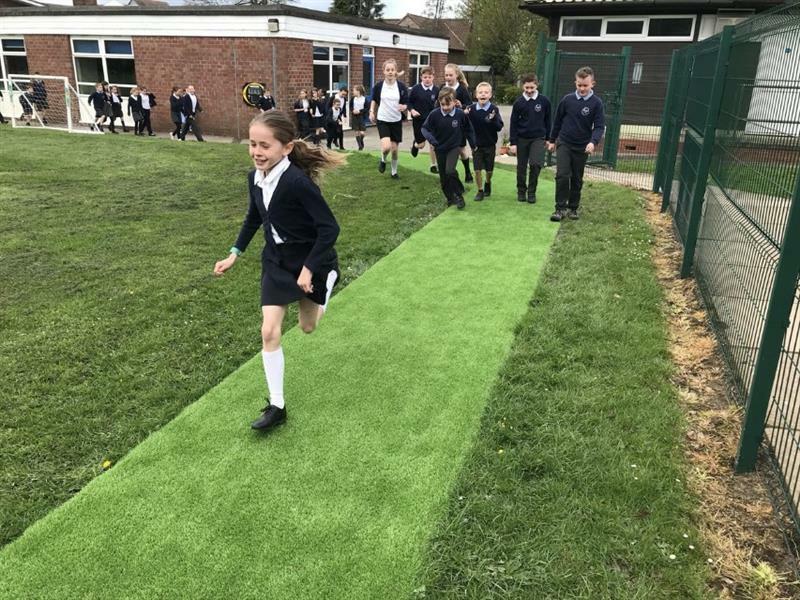 We also install an artificial grass Daily Mile Track to give children every chance of success in enjoying their Daily Mile challenge. We offer an amazing 10-year guarantee with our Artificial Grass surfacing products, so you can be sure that we design and install them to last. 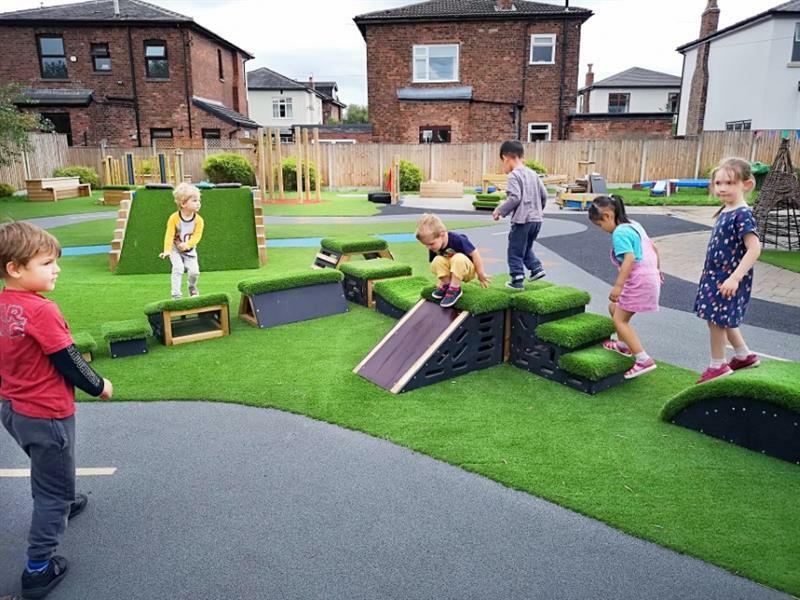 With over 20 years’ experience of creating beautiful outdoor spaces in schools and nurseries, you can have peace of mind that we know just how to transform even the most unloved and previously unusable areas into new and exciting spaces to play to learn and to enjoy sports and exercise.